ABBOTTSTOWN, PA 4/8/2017 – Sometimes you have to slow down to go fast. 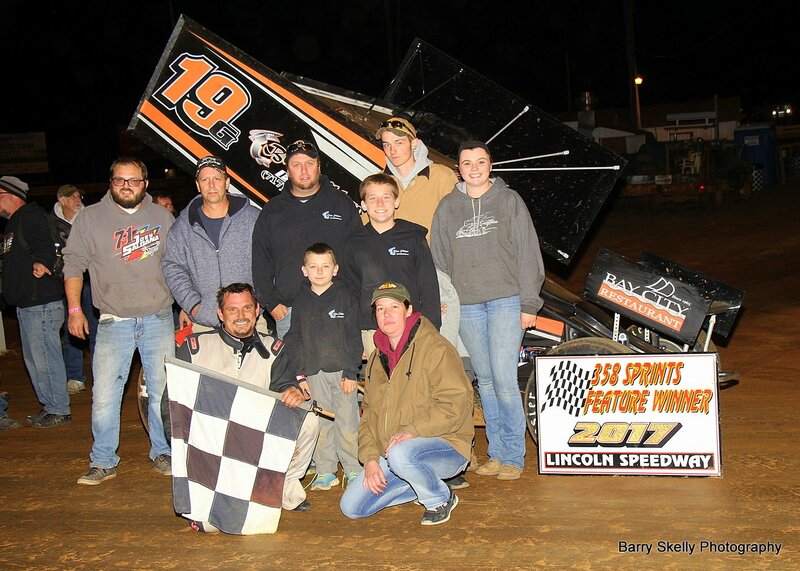 And that’s exactly what Gerard McIntyre, Jr. did to claim his first win of the year in the 25-lap “410” sprint car feature at Lincoln Speedway Saturday night. “I wasn’t here (victory lane) at all last year,” reflected McIntyre upon exiting his Weaver’s Body Shop #16 in victory lane, “It make it a lot easier when you have a real good car. And that’s what Dad gave me here tonight. He just did a phenomenal job. I didn’t really have to drive the thing. Anywhere I wanted to go I just kinda’ drove around them. Handicapping put McIntyre on the outside of row three for the start. Outside front row starter Scott Fisher led the first two laps before fourth-starting Brandon Rahmer took the lead on lap three. McIntyre caught Rahmer for the top spot on lap 16 and led the rest of the way, crossing 2.72 seconds in front of Rahmer. Third through fifth were Matt Campbell (who returned from a vicious crash the week before), 11th-starting Danny Dietrich, and Brian Montieth, who came from 20th starting spot. Fisher settled for sixth, and was followed by Tyler Ross, Jim Siegel, Alan Krimes, and 16th-starting Lucas Wolfe. Heats for the 28 410 Sprints were won by Chase Dietz, Krimes, and Danny Dietrich, with Ryan Smith winning the consolation. 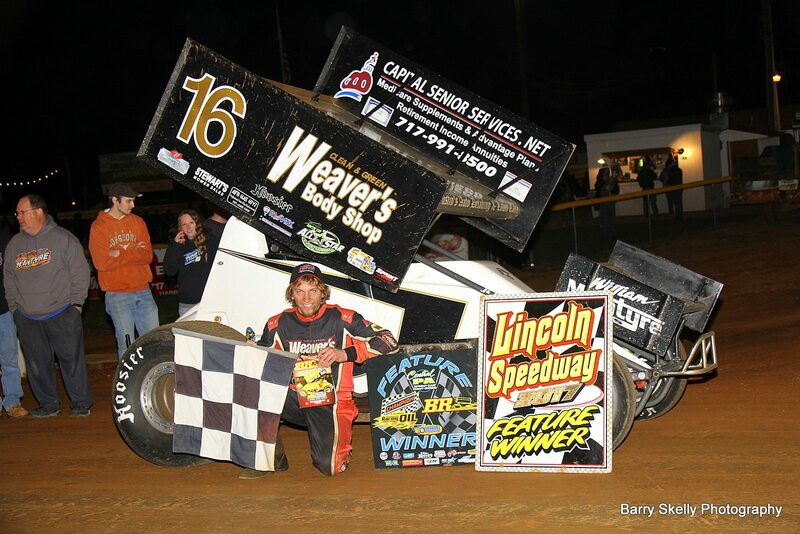 Former 410 sprint car regular and six-time career winner Todd Gracey scored his first Lincoln win in 19 years in the 20-lap 358 sprint car feature. In only his second time out in Evan Taylor’s Blue Ribbon Exteriors #19G, Gracey inherited the lead when polesitter and race-long leader Brie Hershey came to a stop with motor problems in turn two of lap 11. Gracey was challenged by Troy Wagaman, Jr. on the restart, but eventually pulled away for his first-ever 358 sprint car win. Wagaman settled for second, with Jared Esh, Steve Wilbur, and Cody Fletcher rounding out the top five. Doug Hammaker, Adrian Shaffer, Todd Rittenhouse, Jr., Phil Walter, and Brent Shearer completed the top ten. Heats for the 26 358 Sprints were won by Hammaker, Gracey, and Rittenhouse, with Ashley Cappetta winning the consolation. Wayne Dutterer, who had one career win in the Lincoln thundercars of yesteryear, scored the win in the 20-lap street stock feature. Dutterer, who started fifth, led the first four laps before Mike Potts came from his ninth starting spot to take the lead. Like Hershey in the 358 sprints, Potts dropped from the field while leading, handing the top spot back to Dutterer on lap 10. Dutterer held off Danny Beard and Joey Hoffer over the second half of the race to score his first Lincoln street stock win. Fourth and fifth behind Beard and Hoffer were Jim Rost and 12th-starting Chris Heller. Heats for the 24 Street Stocks were won by Heller, Hoffer, and Danny Beard. Next Saturday, April 15th, Lincoln Speedway moves to 7 PM start-time with LEFFLER ENERGY NIGHT featuring the 410 Sprint Spring Championship, paying $5,000 to win and $400 to start, and a regular program of 358 sprints. Time Trials will be held for the 410 sprints starting at 7 PM. Gates open at 5 PM. 410 Sprint Feature Finish (25 Laps) – 1. 16-Gerard McIntyre, Jr. ($3,200); 2. 88-Brandon Rahmer; 3. 16C-Matt Campbell; 4. 48-Danny Dietrich; 5. 21-Brian Montieth; 6. 21T-Scott Fisher; 7. 5-Tyler Ross; 8. 59-Jim Siegel; 9. 87-Alan Krimes; 10. 24-Lucas Wolfe; 11. 8-Billy Dietrich; 12. 39-Cory Haas; 13. 1X-Chad Trout; 14. 99m-Kyle Moody; 15. 51-Freddie Rahmer; 16. 69-Tim Glatfelter; 17. 5G-Chase Dietz; 18. 59RS-Ryan Smith; 19. 14-Coleman Gulick; 20. 39M-Anthony Macri; 21. 6K-Chris Knopp; 22. 74-Dwayne Gutshall (DNF); 23. B52-Scott Geesey (DNF); 24. 2W-Glenndon Forsythe (DNF). No Time. 358 Sprint Feature Finish (20 Laps) – 1. 19G-Todd Gracey; 2. 19-Troy Wagaman, Jr.; 3. 30-Jared Esh; 4. 59-Steve Wilbur; 5. 66A-Cody Fletcher; 6. 66-Doug Hammaker; 7. 27S-Adrian Shaffer; 8. 23R-Todd Rittenhouse, Jr. ; 9. 5-Phil Walter; 10. 12-Brent Shearer; 11. 28-Matt Findley; 12. 119-Chandler Leiby; 13. 9-Dalton Dietrich; 14. 89-Ashley Cappetta; 15. 7-Trey Hivner; 16. 38D-Kyle Denmyer; 17. 19D-Wyatt Hinkle; 18. 41B-“Big Block” Weaver; 19. 511-John Sharpe; 20. 8-Kenny Kuhn; 21. 5Q-Ryan Quackenbush; 22. 91-Brie Hershey (DNF); 23. 5A-Zachary Allman (DNF); 24. 41-Jeff Halligan (DNF). No Time. Street Stock Heat Two Finish (8 laps) – 1. 21-Joey Hoffer, 2. 54j-Jimmy Combs, 3. 39-Wayne Dutterer, 4. 91-Dalton Frye, 5. 86-Scott Strickler, 6. 94-Dalton Myers, 7. 32-Brad Bingaman, 8. 83-Mikey Guise. No Time.